Why Are Tiny Houses So Expensive? The biggest purchase you will make in your life is probably your house. People who are looking to buy traditional houses know that they will need to spend a pretty penny. But, what about tiny houses? Tiny houses seem expensive because of the unique craftsmanship that goes into building them. They are often one of a kind and made to specific needs. The trailer foundation is also costly because they aren’t produced in bulk like other trailers. The issue with the price tag of tiny houses comes down to the same old argument or mass production vs. quality. Here is everything you need to know about the cost of tiny houses. How Much Do Tiny Houses Costs? Could You Build a Less Expensive Tiny House? Will Tiny Houses Always Be Expensive? While traditional homes can be unique in their own way, many are built after the same model. When it comes to tiny houses, the more unique and special they are, the more expensive they can be. There are many factors that go into pricing a tiny house. Let’s take a look. Tiny houses on average cost around $75,000 dollars. The price only goes up for custom-built tiny houses. While this price is small in comparison to large homes, you have to consider the space. While the size and shapes of tiny houses will vary, most do not exceed 300 square feet. Unless they are built on a foundation. The average size of traditional larger houses is 2,500 square feet. This means that tiny houses are a good 1/8 the size of large homes. However, the one thing that cannot be ignored is the price. Traditional homes run an average of $200,000 dollars. So while tiny houses are only 1/8 the floor space, they are still around 1/3 the cost of traditional homes. When you consider the price per square foot, it can seem like tiny houses are more expensive. When you consider that tiny houses are an enigma unto themselves, you shouldn’t see the price tag as a deterrent. One way to make peace with the cost of the tiny house is to realize that square footage of a home is relative. You can just as easily live in a tiny house the same way you could in a larger home. With the right amount of adjustments and sacrifices, there is no reason why living in a tiny house shouldn’t be desirable. So, when you consider that tiny houses are less than half the cost of larger homes, the decision is clear. While most budgets have a little bit of wiggle room, there is only so much you can do. However, there is no reason why you can’t make a plan that works for you and your wallet. When buying a pre-made tiny house, you won’t be able to pick your price the way you want. However, with building your home you can find creative ways to save money so that you can keep overall costs low. One way to help keep your costs low when building a tiny house is to get your finances in order beforehand. Not only will this help you to be in a good spot to invest, but it will also make you a desirable candidate for personal loans. One thing to keep in mind is that building a tiny house is much different than financing a traditional home. This means that either you will have to front all the cash or seek a personal loan. One way to plan ahead is to make sure that you have at least 25% of your overall spending costs put aside before reaching out to builders. The last thing you would want to do it overextend your finances and end up with a half-finished home. The right amount of planning can help protect you and your investment. Everyone dreams about building a home and throwing caution to the wind. However, when looking to build a less expensive tiny house, you need to know what is important to you. This way you can make quick decisions when it comes to when to make financial sacrifices. For example, if you have had your heart set on top of the line tiny appliances to fill your kitchen, budget for it. Otherwise, you may have to settle for last years model. One thing to keep in mind is that building a home is a lengthy process. Don’t rush to make your house perfect. Especially if this means living beyond your means. You’ll have plenty of time to add nice appliances and features later. Some people choose to cut costs by going about the project without the aid of a professional contractor. However, this is one expense that you really need to budget for. Using a professional will come at a higher cost, but the benefits far outway the price tag. The one thing that will cost you the most are the building materials. Using a professionally licensed contractor means that you have their connections. Most notably, you will be able to use their sources to find bulk and locally sourced materials. This is a great way to cut cost! Also, when you work without a professional, you have to plan for mistakes. When it comes to building a tiny house, even small mistakes can put a serious dent in the budget. 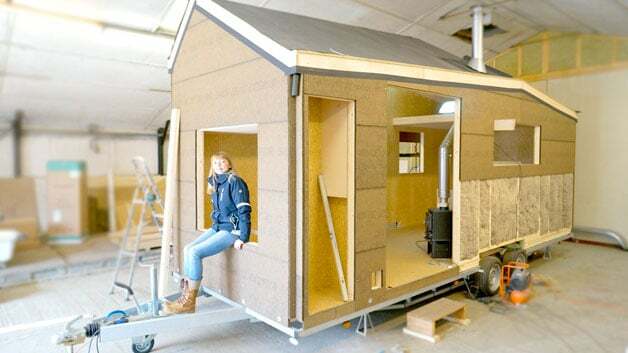 We have made an article here with all the best tips and tricks to finding the best materials to build your tiny house. If you’re looking to build a tiny house, chances are that you already are looking to incorporate repurposed materials in your house. Luckily for you, this not only helps to be less wasteful, but it also helps greatly when it comes to overall cost. Not only that, repurposed and salvaged materials also give the home a special feel and is quite on trend these days. In order to find the best-salvaged materials for your tiny house, you need to have connections. This is where the help of professional contractors come in handy. If you have found a builder who specializes in tiny houses, they may be able to hook you up. This way you can save your time from having to go from salvage yard to salvage yard looking for the perfect piece of wood. While tiny houses do seem to be at the top of the price tag scale, there is hope that this will change. Because there are so many factors that go into pricing a tiny house, watching market trends is essential. One of the main reasons why tiny houses can be so expensive is simply because there isn’t a standard in place yet. When selling a traditional home you have to consider the history of selling homes in that area. However, because downsized living is still seemingly a newer concept, there is no standard trend for them. This has led many tiny house owners to pave their own way when it comes to pricing. This starts the argument of worth vs. value. While some may think that their houses can be prices high because of their personal worth, the value doesn’t always agree. So, how do you change this trend? Unfortunately, the problem will have to naturally resolve itself over time. Fearing the unknown plays a huge part in how tiny houses are priced. There are some people who are looking to make money off of current trends. Tiny houses are no exception to this either. Once tiny houses started to rise in popularity, independent contractors started building the,m and buying up properties like crazy. While they did this in hopes of making money, it ended up harming the market overall. This is because, with a sudden surge of tiny houses, the market quickly became oversaturated. While tiny houses were once rare and few between, they are now more common than people think. The one major downside to this is that with a high supply, the prices have still not dropped. With so many expensive custom-built tiny houses on the market, homeowners looking to sell have had to competitively price their house. It’s a “seller’s market”, so to speak. The demand is very high! The tiny house movement has become a victim of the real estate market. While many people look to get tiny houses to escape that kind of thinking, it isn’t always that easy. At the end of the day, tiny houses are private residences and will always a large purchase. However, don’t let the listing prices scare you. Tiny houses are still far less expensive compared to traditional homes and just as comfortable and convenient. When it comes to buying a tiny home, consider all that you are gaining for just one price.